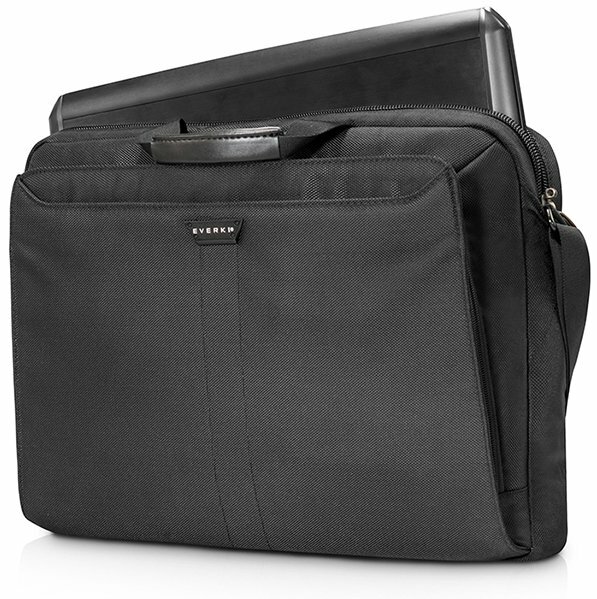 The sophisticated Lunar Laptop Briefcase is EVERKI’s revitalized version of a traditional hard-bodied briefcase. It handles up to an 18.4-inch laptop; and with leather accents and water-repellent ballistic nylon, the Lunar is brimming with style. When you carry a large laptop and prefer the classic, professional look of a briefcase, choose the Lunar. 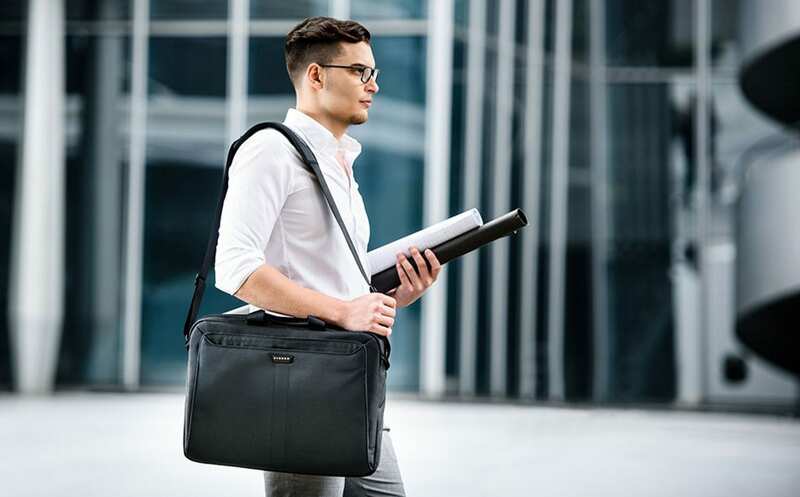 EVERKI’s Lunar Laptop Briefcase is a new take on an old classic, and a great solution for everyday carrying to and from the office or on short business trips. The Lunar gives you the business-professional look that you want, with features like stylish black on black leather accents, ballistic nylon, a soft-body design and our high contrast lining that makes things easy to find. And the slim and sleek Lunar Briefcase handles even the largest laptops - up to 18.4-inch - without being big, bulky or heavy. There’s a place for everything, and you can keep everything in place with the Lunar Briefcase. 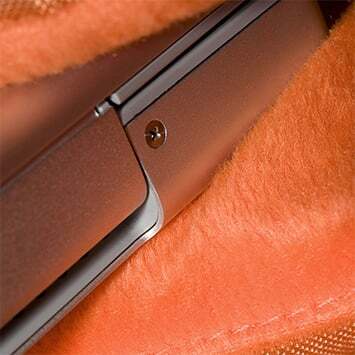 The dedicated laptop compartment is padded with anti-shock foam and lined with our signature orange felt to provide ultimate protection for your device; and there’s a separate accessories compartment with pockets and slots for organizing business cards, pens, adapters, and other accessories. 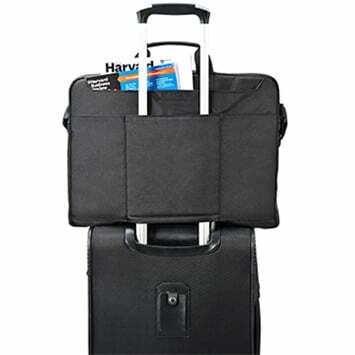 The magnetic pocket on the front of the briefcase gives you easy access to the folders, papers and documents right where you need them, and an additional pocket in the back lets you stash important or more sensitive items, while still allowing quick access. The dedicated laptop compartment in the Lunar Briefcase is roomy enough for the most behemoth 18.4-inch laptop, and it’s felt lined and padded with anti-shock foam to protect your laptop from knocks, bumps and scratches. 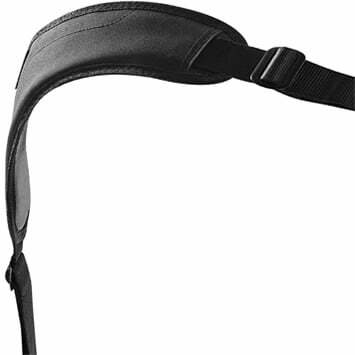 The Lunar incorporates a contoured shoulder strap system to ergonomically balance the load and reduce muscle strain. Dual quick-adjust buckles let you set your desired length on the extra-wide strap, and a large, non-slip shoulder pad conforms to your shoulder. That’s smart design. For business travel or business meetings, the premium leather handles and accents of the black on black Lunar are subtle, yet striking. We designed it to be a perfect companion for the boardroom or the executive lounge. Modern, subtle, sleek. When traveling with many bags, you may need some extra help. The quick-access pocket on the back of the Lunar quickly unzips to become a trolley handle pass-through. Simply slip the Lunar onto the handle of your luggage and you’re ready to wheel through the airport. I had trouble finding a suitable laptop bag for my rather bulky MSI GT72S (17.3"). This fits the bill brilliantly. Even though Im not a big fan of sleeve type laptop compartments, this seems to work just fine! Lots of other compartments and pockets to carry other needed stuff including a nice power brick zip in. One of the best standard type laptops bags I've had to date! Feels sturdy enough for work prolonged work trips as well! I have a massive Alienware 18, with the 330W Power brick, which with everything else weighs more than 8 Kg. It has been 5 years since I got my Lunar, They fixed the handle problem, and 5 years and 15 countries later, no problem whatsoever. This is the best buy I have ever made, highly recommended if you are looking for a long term solution to your heavy travelling tech life. 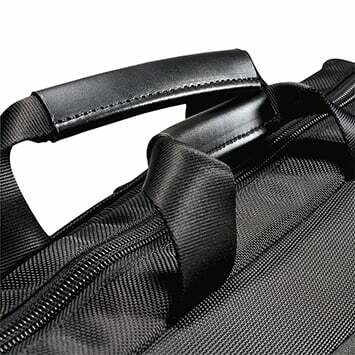 I've had one of these bags for about three years and had absolutely no issues with it at all, in fact I would say that looking at most of the bags we get for our customer use laptops, the Everki brand is just head and shoulders above any that I have seen or used. I use this bag daily and it has never let me down, that was until I noticed the handle stitching just started to fail on me. 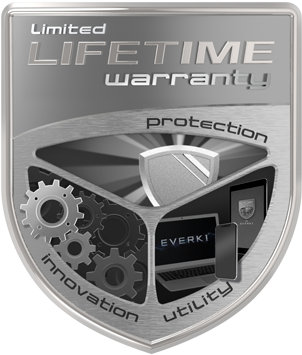 Remembering the Lifetime warranty I contacted customer support regarding this via the Everki website. Possibly within hours of my submission I received a nice email from Paul in the support team advising me what I should do. As I could not follow the instructions at that very moment there was even a pause whilst a holiday for me was involved, once I was back the bag was swapped in the most amenable manner I have ever had with a customer support team. New bag is up and running, it even made me clear out some of my old stuff I no longer used. I would just like to thank the customer support staff for their handling of the swap, and if any one every asked I wouldn't hesitate in recommending any Everki bag, even though I have only used the Lunar. I have used this bag for the last 5 years, been with me in all my travels throughout the world. I used the bag carrying my G73SW laptop, the fit is perfect, then since last year I change to a G751JY laptop. Aside from a small tear from the wear on the side of my bag, bag still looks good . Definitely a recommended buy. I struggled to find a bag for my Asus G750JS and was delighted when I came across this bag. I received it yesterday and am extremely pleased with the overall quality and design. Even after packing all of my accessories, it is hardly bulky and the felt lining is great for the laptop. While I did find the web site quite easy to use for ordering online, I did experience a negative aspect with the service delivery of the product which had the unfortunate consequence of marring the overall purchasing experience. I live in Australia and Everki uses Couriers Please which I DO NOT recommend. The courier failed to meet their service level agreement after the goods had been loaded for delivery and were sitting on the truck for 3.5 days with a driver who only services one area. I won't go into much detail here, but I was also alarmed when I discovered a products review site for this company with ~680 customer reviews, all with horror stories and an overall rating of 1.4 out of 5 stars! That is not a good record for a business. I purchase many products online and am accustomed to receiving deliveries from couriers, however this was the most appalling service delivery I have ever experienced. I would hope that Everki considers using another courier service in Australia for their customers. Even Australia Post would be far more reliable, trustworthy and efficient.